Share an educational adventure during school holidays with your children. 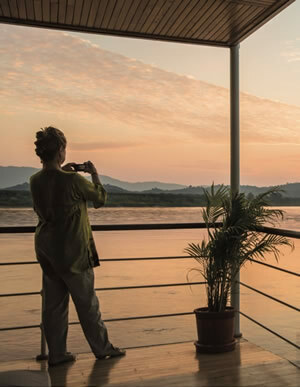 Explore Asia in the comfort of a Pandaw vessel including daily excursions, full board, local drinks, cultural performances, movie nights and free mountain bikes to explore rural villages, temples and countryside. Pandaw is introducing a Family Promotion during school breaks. Families choosing to travel on the Andaman cruise please be aware that children will sleep with the Parents in the cabin. We will provided an extra single bed that will be set up in the private lounge are of the cabin. Cabins 7 - 8, 11 - 12: does not have a suite so kids can’t share. Pick one of the below dates and reserve your cabin via your travel agent or pandaw.com. Send the passport scans of your children to information@pandaw.com so we can adjust the price of your childrens accommodation. NOTE: Port tax is still charge for each child traveling.